oFrom the Build Specifications of your product, click on Create a new BLT executable. oBLT now requires you to interact directly with LabVIEW. Click Continue and click the LabVIEW icon in your task bar to continue. oType a name for your executable. 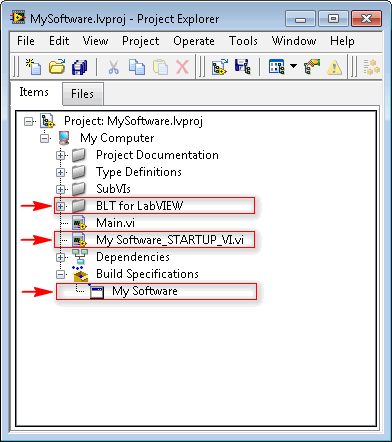 oSelect the Startup VI for your application. oSelect the Target path for your exe. oClick on CREATE BUILD and wait for the process to complete. You have to select a valid Startup VI and a valid Build Target Path to have this button enabled. ■A Startup VI. This VI replaces the startup VI you've selected during the creation of the BLT exe. This new startup VI has been automatically generated and configured to launch your application correctly. ■An executable build specifications. This exe is configured to include everything needed by BLT to work in your application. 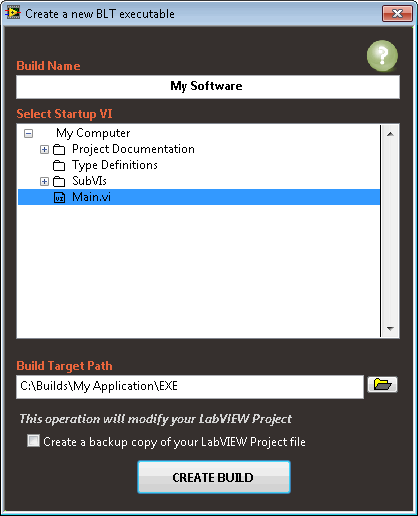 See the LabVIEW Help for more info.